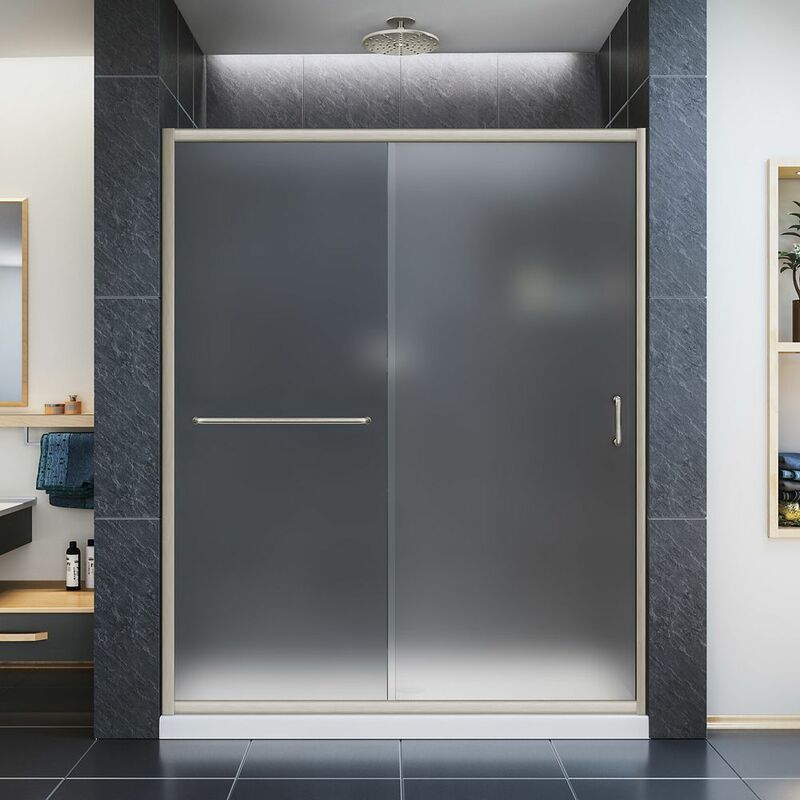 The DreamLine Charisma shower or tub door has a contemporary, bold frameless design, bringing the functionality and convenience of a double sliding bypass action to your bathing area. The Charisma glides smoothly on sleek Upper and lower rails, without the significant framing of a typical bypass shower door. DreamLine exclusive ClearMax water and stain resistant glass coating adds superior protection from stains and is nearly maintenance-free. The Charisma model provides an innovative design adding style to any bathroom space. Infinity-Z 56-inch to 60-inch x 72-inch Semi-Framed Sliding Shower Door in Brushed Nickel is rated 4.7 out of 5 by 49. Rated 5 out of 5 by Joe from Great product. Highly recommend it. Advice though: I installed it in conjunction with a Sterling ... Great product. Highly recommend it. Advice though: I installed it in conjunction with a Sterling shower enclosure kit. I put studs in the locations needed for the enclosure kit so it went in fine. But I didn't realize I would need additional studs located to align with where you screw in the shower glass frame (my bad). I worked around it by using different anchors than the ones provided with the Dreamline kit and anchored it to the enclosure. Make sure you pay attention to the special notes in the instructions. They are very helpful. PS - This is the first time I have ever put something like this in. It took about five hours for me. Be patient and have someone available to help with the heavy lifting if needed. Rated 5 out of 5 by Danetta from I love these shower doors. I used it to enclose... I love these shower doors. I used it to enclose my Walk-in shower. Rated 5 out of 5 by Grammie from Works great and looks nice too.... Works great and looks nice too.